We’ve reviewed the standard configurations of the 2011 MacBook Pros, and recently we looked at a build-to-order (BTO) 15-inch MacBook Pro with a faster, 2.3GHz Core i5 processor option. This report focuses on another BTO MacBook Pro, a 13-inch 2.3GHz Core i5 dual-core model that replaces the standard 5400-rpm hard drive with an optional solid-state drive (SSD) upgrade. 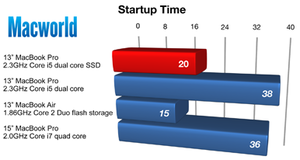 SSDs offer great speed, but their price per gigabyte is very expensive. Apple’s least expensive SSD upgrade adds $250 to the price of the entry-level MacBook Pro, raising the price from $1199 to $1449, while lowering the storage capacity from 320GB in the hard drive to just 128GB in the SSD. Higher-capacity SSDs are available from Apple, but they’ll cost even more. A 256GB SSD adds $400 to the base price, and a 512GB SSD adds $1000—nearly as much as the laptop itself. What does the extra money buy in terms of performance? Faster boot times, for one thing. The standard 13-inch MacBook Pro took 38 seconds to start up, while the laptop with the SSD upgrade was ready to go in just 20 seconds. A standard-configuration 15-inch 2.0GHz MacBook Pro with a hard drive took 36 seconds, while a 13-inch 1.86GHz MacBook Air with its standard 256GB of flash storage took just 15 seconds. You also get faster application launches, and faster disk functions. 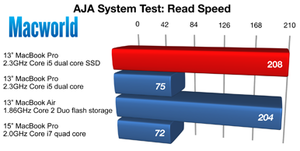 Overall, results from our Speedmark 6.5 test suite showed that the SSD-equipped MacBook Pro is 20 percent faster than the standard model with a hard drive. 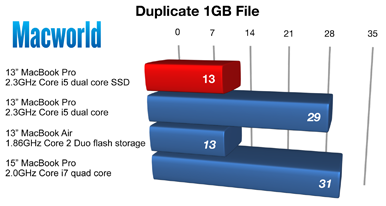 Duplicating a 1GB file took just 13 seconds on the SSD model, while the standard model took 29 seconds. 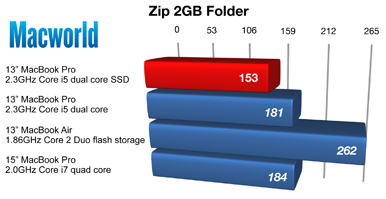 Zipping a 2GB folder took 2 minutes, 33 seconds on the SSD model, while the same task took just over 3 minutes on the standard model. 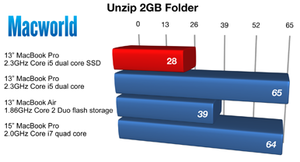 Unzipping the file from the Zip test file took 38 seconds on the SSD model, compared to 65 seconds on the standard model. Importing and exporting iMovie files was faster on the SSD model, as was opening a large Word document in Pages. The storage device did not affect the results in tests that rely solely on the graphics processor or CPU. Those results were the same for both laptops. With the SSD upgrade, the 13-inch 2.3GHz Core i5 MacBook Pro also outperformed the $1499 13-inch 2.7GHz Core i7 MacBook Pro with its 500GB 5400-rpm hard drive by 8 percent, overall. Again, as expected, the performance gains were in the most disk-intensive tests, not CPU or GPU-dependent tasks. File duplication and Unzipping compressed files took half as long on the SSD model than on the standard 13-inch 2.7GHz MacBook Pro. Handbrake, Cinebench CPU, and MathematicaMark were all slightly faster on the 2.7GHz MacBook Pro. Even with an SSD, the BTO 13-inch 2.3GHz MacBook Pro was not able surpass the overall system performance of the standard $1799 15-inch 2.0GHz Core i7 MacBook Pro. The 15-inch model was 5 percent faster in our Speedmark 6.5 tests than the BTO 13-inch model. The SSD BTO laptop was 58 percent faster in the file duplication tests and 56 percent faster in unzipping our compressed file, but when it came to Handbrake, MathematicaMark, and Cinebench, the BTO laptop’s dual-core Core i5 was no match for the quad-core Core i7 in the 15-inch model. The 15-inch model’s Call of Duty frame rates were nearly twice those of the BTO 13-inch MacBook Pro. Comparing our SSD-equipped 13-inch MacBook Pro to another Mac portable with solid state storage—the 13-inch 1.86GHz Core 2 Duo MacBook Air—we found the Air to be faster at startup, and it tied the 13-inch MacBook Pro in our file duplication tests. The MacBook Air was also better than the BTO 13-inch model in the Call of Duty and Cinebench OpenGL tests, but that’s where the good news ended for the MacBook Air, as the its Core 2 Duo processor struggled to keep pace with the dual-core iCore 5 processors in the SSD-equipped MacBook Pro. 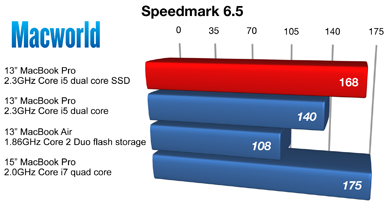 You can take a look at our Speedmark 6.5 results and see how the BTO SSD-equipped 13-inch 2.3GHz Core i5 MacBook Pro did compared to other laptops. Have more systems or applications you’d like to see tested? Make your suggestions in the comments area. We’d love to hear them. Results are megabytes per second. Longer bars are better. Reference models in blue and italics. Results are in seconds. Shorter bars are better. Reference models in blue and italics.